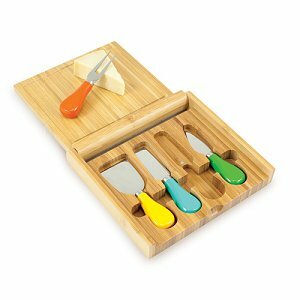 The Carnaval Cutting Board with Cheese Tools features a beautiful bamboo case which opens to reveal a cutting board and four stainless steel cheese tools with multi-colored handles inside. The color and rich beauty of the Carnaval will help set the mood for your festive party. Compact and fully-enclosed, the Carnaval travels well when the party is away from home.